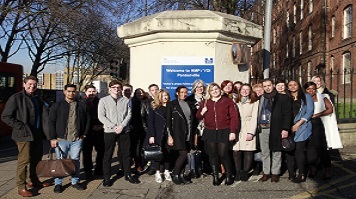 In a first for a London university, London South Bank University (LSBU) undergraduates have been studying a university course with a group of inmates at HMP Pentonville in Islington. Jenny Fogarty, Senior Lecturer at LSBU, devised the course that looks at the history and development of social justice in educational practice through the decades. She has been taking a group of eight LSBU students into the prison every Wednesday over a period of twelve weeks, to study alongside a group of 10 Pentonville inmates. The course is part of an educational initiative, Learning Together, which brings together people in prisons and universities to study alongside each other. Jenny said: “It has been an excellent, challenging and exciting project which has seen us all grow and develop. LSBU student Dan Dunham, who completed the course, said that when first entering the prison he was hesitant and anxious. Rolly, one of the prison inmates who took the course, said it had opened his eyes to how everyone has their own view about what education should be like in the 21st century. “I really enjoyed learning and working with the LSBU students and this course has made me want to continue with my education,” he added. Shan Wareing, LSBU’s Pro Vice-Chancellor and Professor of Education and Student Experience, presented certificates of completion to both sets of students in front of Kevin Reilly, Governor of HMP Pentonville. All of the students, including the prisoners, had a friend or family member present with them to watch them complete. Rachel Billington, journalist, author and daughter of renowned prison reformer Lord Longford attended, together with representatives from the Prisoners’ Education Trust and other prison reform organisations. “We believe that partnerships such as this one, that bring universities and prisons together, can have a deeply transformative impact - not only on the individuals who take part but on the wider prison estate and university sector.